Featuring the powerful twin-pump, 1/6 Hp motor, the Power Jet Pro is equipped with twice the features of most compressors like two air pressure regulators for precise adjustment of airflow at two individual workstations. 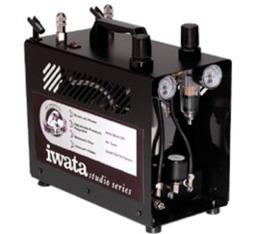 Built with Iwata's Smart Technology, it automatically shuts off when not in use. Economically priced, the Power Jet Pro has a 2 liter tank reservoir and delivers all the power necessary for use.